The Arctic ice cap floats above vast deposits of oil and gas while sustaining along its perimeter one of the most biologically productive ecosystems on earth, supporting polar bears, walruses, commercially important fisheries and huge populations of migratory birds. ExxonMobil's current business strategy is a danger to its shareholders and the world. We were reminded of this once again in a report of the National Petroleum Council's Arctic Committee , chaired by ExxonMobil CEO Rex Tillerson. The report calls on the US government to proceed with Arctic drilling for oil and gas – without mentioning the consequences for climate change. While other oil companies are starting to speak straightforwardly about climate change, ExxonMobil's business model continues to deny reality. That approach is not only morally wrong; it is also doomed financially. The year 2014 was the hottest on instrument record , a grim reminder of the planetary stakes of this year's global climate negotiations, which will culminate in Paris in December. The world's governments have agreed to keep human-induced warming to below 2º Celsius (3.6º Fahrenheit). Yet the current trajectory implies warming far beyond this limit, possibly 4-6º Celsius by the end of this century. The answer, of course, is to shift from fossil fuels to low-carbon energy like wind and solar power, and to electric vehicles powered by low-carbon electricity. Many of the world's biggest oil firms are beginning to acknowledge this truth. Companies like Total, ENI, Statoil, and Shell are advocating for a carbon price (such as a tax or permit system) to hasten the transition to low-carbon energy and are beginning to prepare internally for it. Shell has stepped up its investments in carbon capture and sequestration (CCS) technology, to test whether fossil-fuel use can be made safe by capturing the CO 2 that would otherwise go into the atmosphere. This is not to say that all is agreed with these companies; they have promised to state their climate positions and policies in advance of this year's climate summit. Yet at least they are talking about climate change and beginning to face up to the new long-term market conditions. ExxonMobil, alas, is different. The company's management, blinded by its own vast political power, behaves with a willful disregard for changing global realities. It lives in a cocoon of Washington lobbyists and political advisers who have convinced the company's leaders that because the US Senate is currently in Republican hands, the business risks of climate change have somehow been nullified, and that the world will not change without or despite them. At the same time, ExxonMobil is not some marginal actor in the planetary drama. It is one of the central protagonists. According to a 2013 study , ExxonMobil ranks second among the world's companies, just behind Chevron, in total contributions of CO 2 emissions. Indeed, the study finds that this single company has contributed more than 3% of the world's total emissions since the start of the fossil-fuel age! So what does ExxonMobil say about the new climate realities? How does it reconcile its corporate policies with planetary needs? Unfortunately, the company basically ducks the issue. When asked by independent analysts such as Carbon Tracker how it plans to square its relentless oil drilling with the planetary limits on fossil-fuel use necessary to stay below the 2º climate-change threshold, it ignores the limits. It blithely believes that the world's governments simply will not honor their commitments (or that it can lobby its way out of fulfilling them). And so we come to the recent Arctic report. 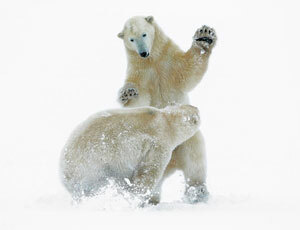 The Department of Energy asked the National Petroleum Council, an industry group, for its advice on Arctic drilling. What it received from Tillerson's committee is an exercise in misdirection. The development of the Arctic's oil and gas resources would contribute to warming far above the 2º limit. The Arctic itself is warming far faster than the planetary average, potentially causing massive, global-scale climate disruptions – which may include the extreme weather patterns recently observed in the US mid-latitudes. For these reasons, the best recent science, including an important study published in Nature this year, provides a clear and unequivocal message: Keep the Arctic oil in the ground and beneath the deep seas; there is no safe place in the climate system for it. This would have been a fitting topic for the National Petroleum Council's Arctic study. But the report never takes up the issue of whether Arctic oil and gas resources are compatible with climate safety. ExxonMobil's brazenness should be deeply troubling for its shareholders. The company's management is planning to spend vast sums – perhaps tens of billions of dollars – to develop Arctic oil and gas reserves that cannot safely be used. Just as the global shift toward renewable energy has already contributed to a massive drop in oil prices, climate policies that will be adopted in future years will render new Arctic drilling a huge waste of resources. Pension funds, universities, insurance pools, and sovereign wealth funds worldwide are grappling with the increasing risks, both moral and financial, of owning shares in oil, gas, and coal companies. As Lisa Sachs and I recently explained , responsible investors must urgently query these companies about their business plans to comply with the 2º limit on warming. Business plans that include investments in the Arctic, the ultra-deep sea, and the oil sands of Canada have no place in a climate-safe world. ExxonMobil's investors must urgently query the company's management on a business strategy that contradicts global needs and policy agreements. If ExxonMobil persists in its dangerous business strategy, the company's investors should quickly conclude that the time has come to pull up stakes and move on. Jeffrey D. Sachs, Professor of Sustainable Development, Professor of Health Policy and Management, and Director of the Earth Institute at Columbia University, is also Special Adviser to the United Nations Secretary-General on the Millennium Development Goals. His books include The End of Poverty , Common Wealth , and, most recently, The Age of Sustainable Development . Petroleumworld does not necessarily share these views. Editor's Note: This commentary was originally published by Los Project Syndicate on April 17, 2015. Petroleumworld reprint this article in the interest of our readers.